The facilities offer everything I could need when experimenting with ideas and materials. “Every week the University invites a guest lecturer who is often renowned for their work within architectural practice; these guests regularly come from around the world with many fascinating thoughts and ideas. The lectures are greatly inspiring for us, allowing us as young architecture students to excite and motivate our imaginations. Carmody Groarke was particularly fascinating with his ‘Studio East Dining’ design in which he questioned the typical conventions of dining and created something unique." How do you find the facilities and teaching staff on your course? “The facilities offer everything I could need when experimenting with ideas and materials. They allow me to model-make with a variety of machinery and equipment whilst surrounded by others that can help by offering advice. I enjoy spending time in the design studio as it spacious and an inspiring place to work, however when it closes in the evening I find the library particularly useful as it is open 24 hours." “The staff are constantly there for guidance and support. Their experience within the architectural field never fails to help inspire and encourage us as students to pursue the career ourselves. 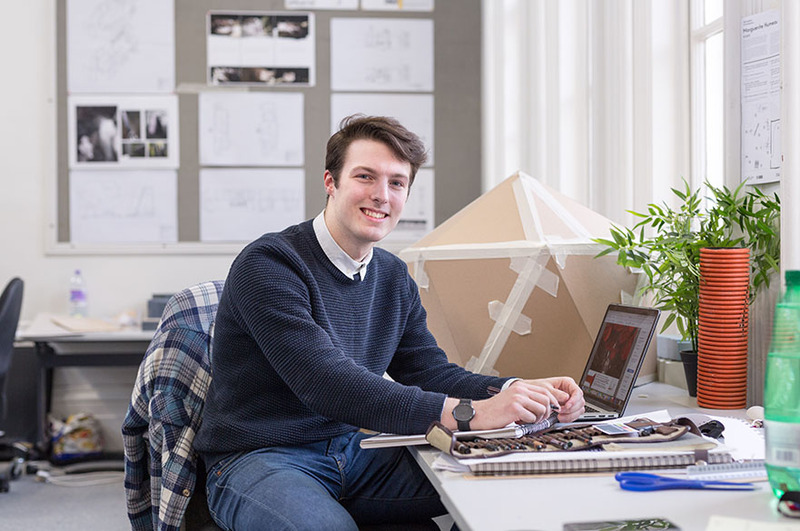 I believe that, like myself and many of my peers, they truly love the course and the world of architecture; this is always shown when they teach and helps me become excited by it as well." Tell us about a recent live project you’ve enjoyed on the course? “We undertook a project for a client who requested a new community building for the ‘Growing Spaces’ charity located in Sneinton, Nottingham. Requesting an eco-friendly and inexpensive build, we were put into small groups to collaborate and design a proposal which we presented to the local community. Whilst proposing our ideas, the public voted on which they would like to see built by local volunteers including ourselves. Whilst still awaiting construction to start, this project allowed us to actively engage with real clients and real communities of people making it feel as though we were making our own impact on the local area." What advice would you give someone interested in studying Architecture at uni?